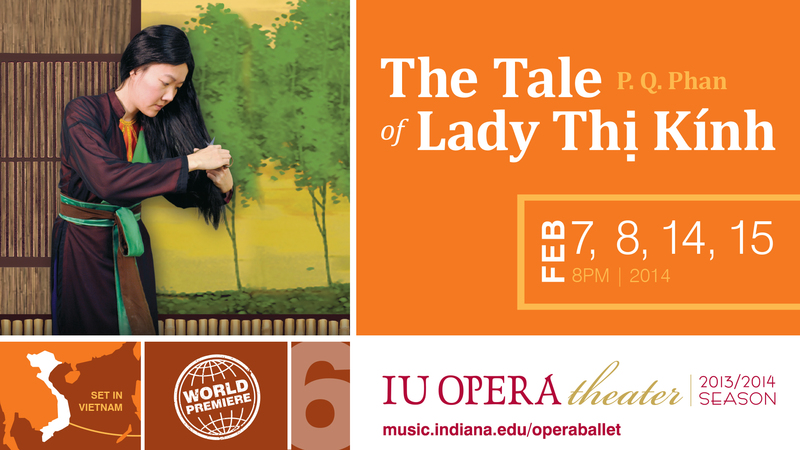 A couple of weeks before the curtains rise on the stage of IU Opera Theater premiering The Tale of Lady Thị Kính by composer and librettist PQ Phan, lighting designer Todd Hensley has been at site working hard. I had a very brief talk with him yesterday, Monday, February 3, 2014. Brief, but enough to marvel you about the lighting aspect of the show that you are going to see on stage on February 7, 8, 14 and 15. What do you want to achieve with lighting for this show? This show is very interesting in that we are taking a somewhat unusual approach. 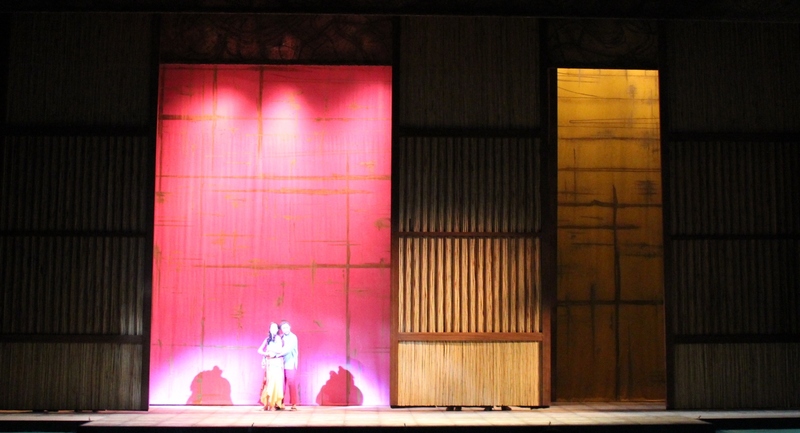 In a lot of operas, there is a lot of lighting that is hiding things, say, an old painted set. You may only put light in a small portion of it to reveal just one little piece and leave lots in the dark and leave it to the imagination. 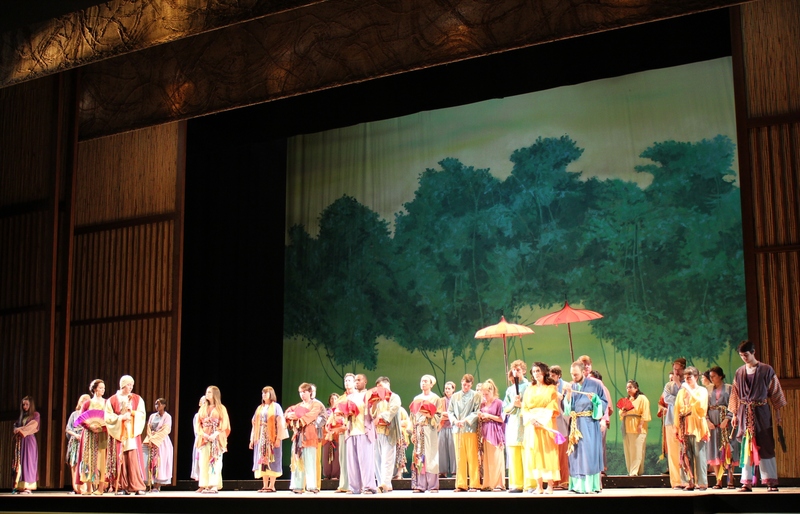 In this opera, we are taking a different approach where the inspiration is from the Đông Hồ prints. 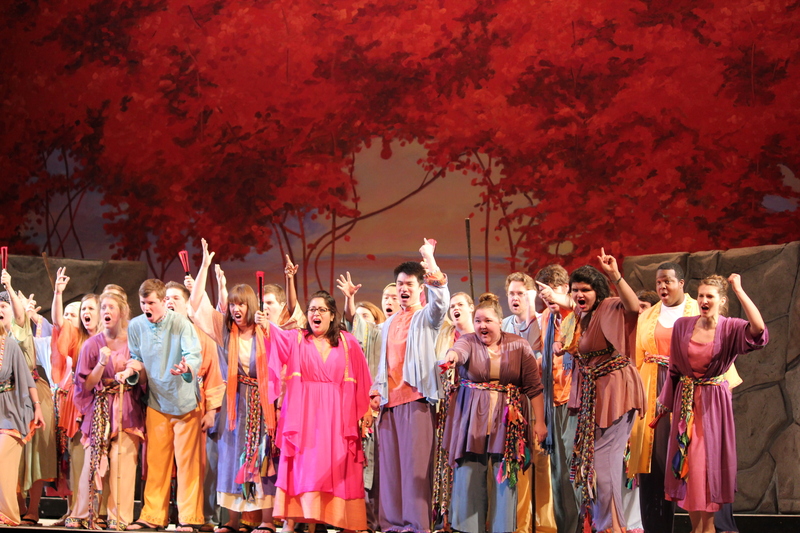 We’ve got gorgeous painted scenery, beautiful costumes. And the idea is that the light should unify it and show everything that is on the stage. 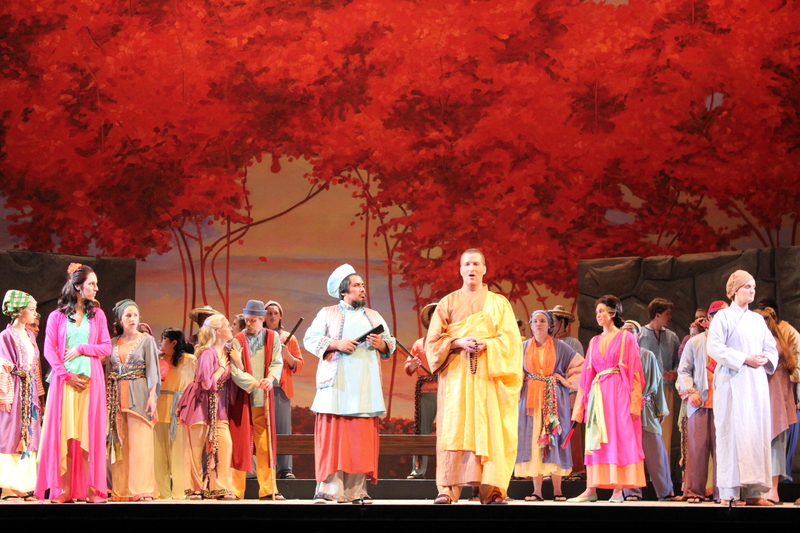 It is not a very typical approach in a lot of operas, but in this case, we – the design staff – feel that we’ve got those tools working very well: beautiful paintings and wonderful costumes. And the lighting is meant to unify those and make them look like one picture. The panels start to define the frame of the picture when they move into their various places. 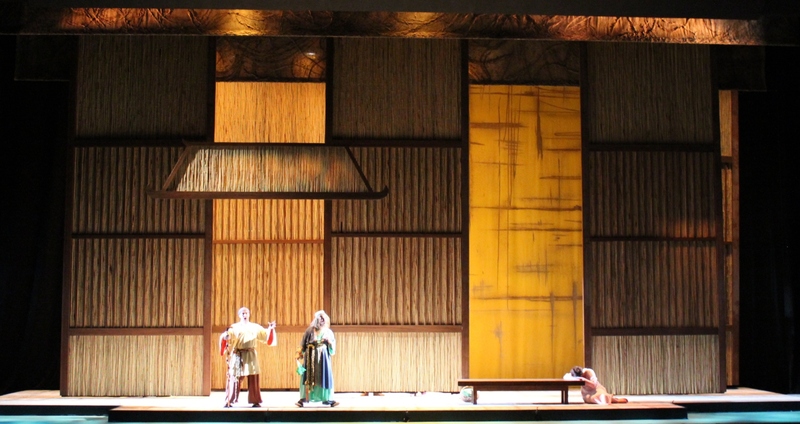 Of course they make architectural sense to reveal shapes on stage, but I treat them almost like picture frames. So you’ve got the gorgeous costumes inside the painted drop framed by those panels, and the lighting has a lot of clear light which again I don’t typically do that often. But in this case, how to get those very vivid costume colors against the very vivid drop to look like it is one picture. That is what I’m trying to achieve. That leads to the next question: How does lighting add to the dimension on stage? The goal is that people will see a very similar look even though their view is rotated left and right and center. We achieve that with a lot of cross light, a lot of light off in the wings coming in to reveal the side of the singer. That is how we make them look three-dimensional. Even though we’re using prints as an inspiration, we cannot throw light from the front and flatten everything. It would not look up to the expectations of the audience. 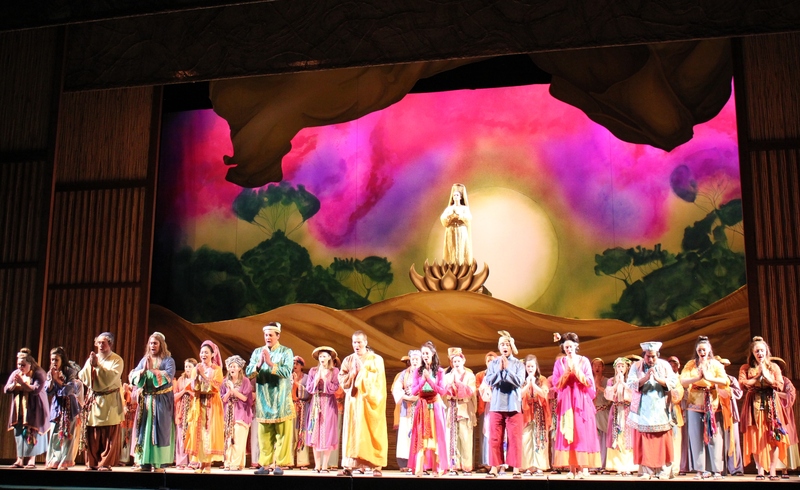 And the more side light we pour in, we get highlight on the clothes, all those great colors where the silk is folding and draping, we can push colors into those folds which is nice, and reveal people as three dimensional shapes on stage. How does lighting help with characterization? Since we are using the prints as an inspiration, we are avoiding “indicating” – we are not using light to ‘indicate’ we are inside the room or out in the woods. We don’t have leafy gold boughs, or window patterns to ‘indicate’ we are now inside the house. We want to avoid that totally. The light is more of an expressive tool for everybody. I am helping and manipulating the characterization more with colors and the intensity – how bright it is and if the color is warm or cool. We are not even being very slavish, I would say, whether it is night or day. You still have to make a gesture to that and everybody knows in the libretto that we have a cold night or sunny day, so people know but we are not seeking to look for moonlight or shafts of sun, as you might in other operas. Instead, I am looking to emulate the print. And the print has very uniform blocks of colors. So a day would be a big wash of yellow. A night would be a gentle wash of pale blue, that kind of things. That helps with the character as well because we get to the intensity of the light. For instance the seduction scene: the light coming largely from overhead, pink color against a pink panel. That works very well. How does lighting enhance the already elaborated set? I am finding that the drops have apparent color and they have layers of color. It is a little bit like an actor’s skin. 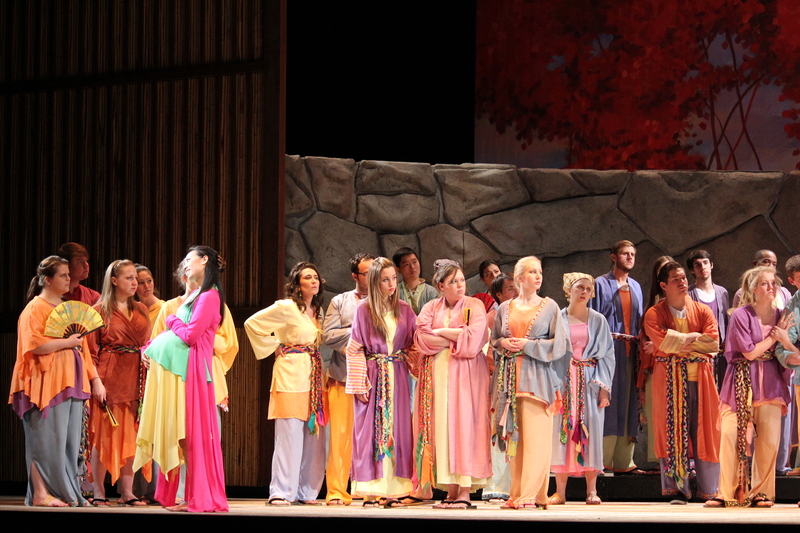 When I light a show, I always seek to find what the skin tones are like. In this case, it is mostly Caucasians and Asians. So I’m looking to find the commonality in the skin tones. The drops have the same layers of color that you find in somebody’s skin. So I turn on slightly various colors and discover new colors in the drop which is great because then we can emphasize what is important for each moment. How does lighting help bring the performance or the singer closer to the audience, or make the connection to them? We are always seeking to make the performer feel closer in the same way a musician wants the soloist to be as close to the listener as possible. I am trying to get the singer as close to the audience as possible. 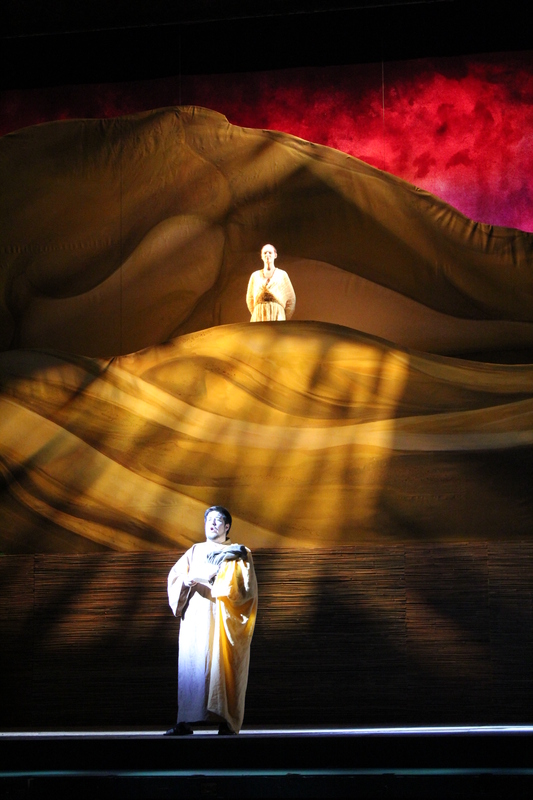 That is done through two things: overall composition on stage, and the manipulation of light right on the singer. These are often two very different pieces of the work. Similar to light in a European painting: you have a primary focus – what am I supposed to look at right now, then you might have a secondary focus, you might have third and fourth levels of focus, meaning as I look around that stage picture, I see that right away, I notice this, then if I pause I notice this, and later on I notice that. I’m always trying to get that in the pictures: what is the primary, secondary, tertiary areas of focus. And then get to the fourth level as well. That is all a case of balancing, in real time, people moving through three dimensional space. What is it like to work with bamboo? It is very pleasant. 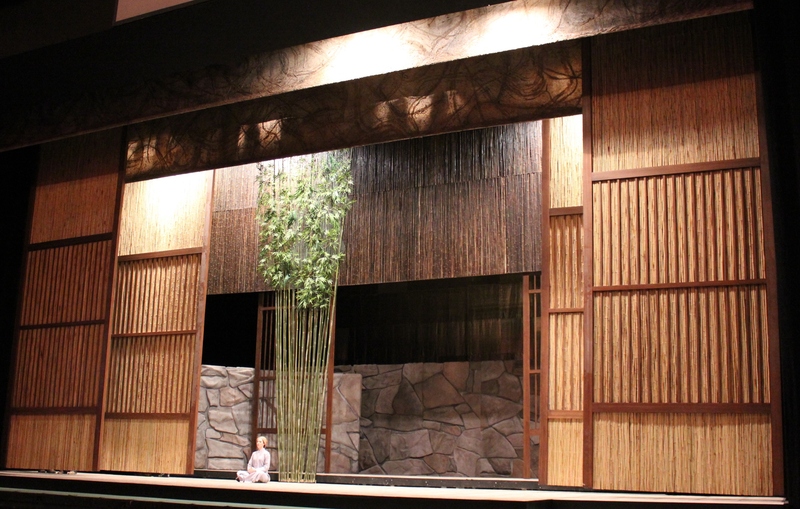 We have panels covered in bamboo and real bamboo to emulate the tree. Both are working out well. 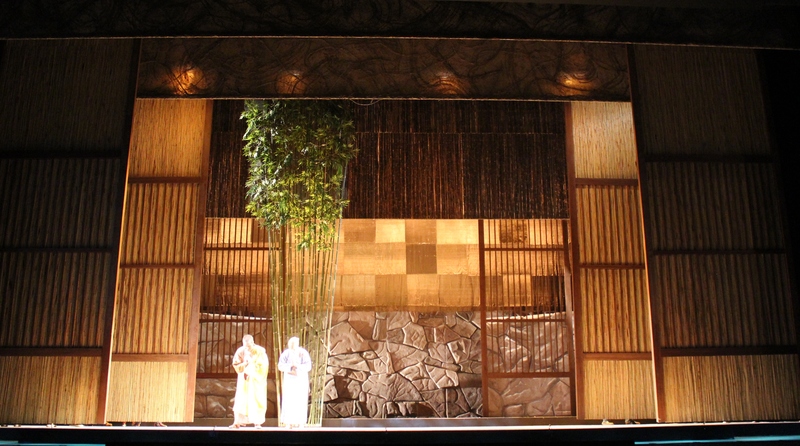 Sometimes on stage you worry about such a small element such as the thin bamboo tree not reading, not being clear as it is far off the stage from the audience. In this case, we add a little light on those panels and it comes across really well. 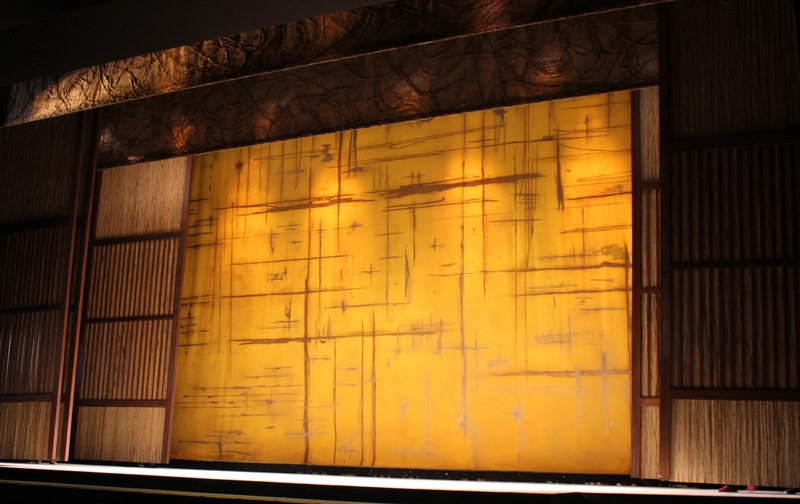 I think all the paintings on the show are top-notch, really beautifully made, whether it is the bamboo or the yellow wall paper, the gorgeous autumn and spring drops, the gold drop with fabrics. They have so much gorgeous details. By the time we get to the finale drop, it is a perfect extension of everything that we are looking at all night. Todd Hensley has supervised theatre consulting services for over 350 projects since joining Schuler Shook in 1988. He brings a 30-year background in theatrical production and facilities design to his consulting work. 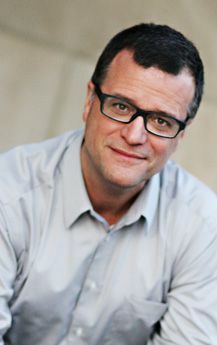 His continued involvement in professional theatre informs his work as a consultant and strengthens Schuler Shook’s ongoing connection to the performing arts. 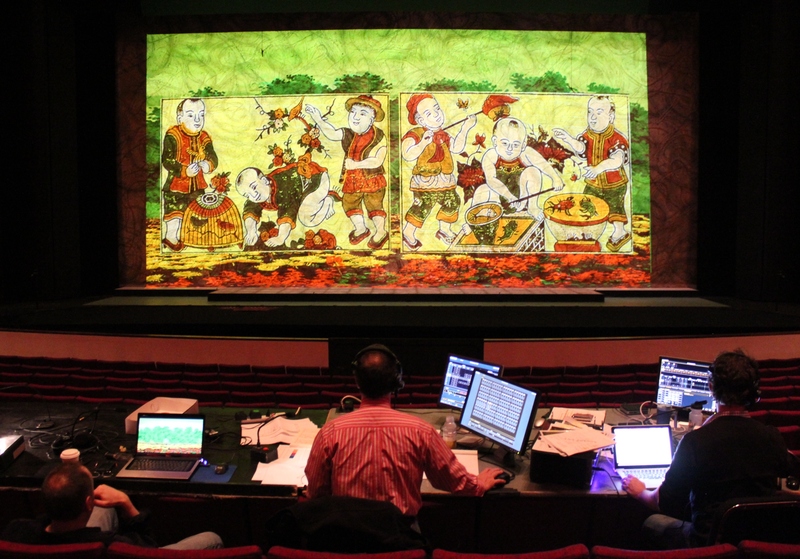 His background includes theatrical lighting design for such companies as The Goodman, Victory Gardens, and Northlight Theatres in Chicago, and opera companies in Chicago; Miami; San Diego; Washington, D.C.; Minnesota; Cleveland; Milwaukee; Tulsa; and Virginia. Todd has been a guest lecturer for architecture classes at the University of Kansas, the Illinois Institute of Technology, and the Illinois Institute of Art and has taught theatre courses at DePaul University.